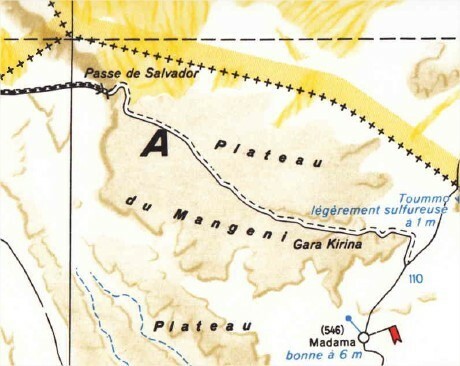 The Passe de Salvador runs past the northwest side of north-eastern Niger’s Plateau du Manguéni, near the frontier between Libya, Algeria and the Agadez region of Niger. On the Niger side, the pass connects to the smugglers’ route running across the Ténéré du Tafassâsset desert parallel to the Algerian border in northern Niger, a route used by veteran Algerian jihadist Mokhtar Belmokhtar when he withdrew his forces from northern Mali to southern Libya in early 2013. The Passe de Salvador has traditionally been controlled by Adrar Tuareg centered on the south-western Libyan town of Ubari, unlike the Passe de Toummo on the southern side of the Plateau du Manguéni, which is controlled by the Tuareg’s traditional nomad rivals, the Tubu, who operate on both sides of the Libya-Niger border. Passe de Salvador, top left; Fort Madama, bottom right. The 2e Régiment étranger de parachutistes (2e REP) was originally raised from Foreign Legion troops in 1948 for use in the French colonies of Indochina. Few members of the regiment survived the French defeat at Dien Bien Phu in 1954 (in which the “paras” played a prominent role) and the subsequent imprisonment of the survivors by the Viet Minh. Since then, the rebuilt airborne unit has served on numerous operations in the Balkans, Afghanistan and across a host of Middle Eastern and African countries. Now based in Corsica, 2e REP is likely to be the first unit deployed in foreign operations as the lead unit of France’s Rapid Reaction Corps and is kept at a stage of alertness that allows it deploy within 24 hours of receiving orders. 2e REP arrived in northern Mali from a French base in Côte d’Ivoire in dramatic fashion on January 28, 2013 with a parachute drop of a company-size unit into the region just north of Timbuktu to cut off retreating jihadists being pushed north by French armor, marine infantry and Chadian forces during Operation Serval (in the event, no jihadists were encountered by the 2e REP). An unidentified French Special Forces unit (possibly elements of the Commando parachutiste de l’air n°10 (CPA 10 – No. 10 Air Parachute Commando) carried out another drop on northern Mali’s Tessalit Airport on the evening of February 7, 2013 as part of a complex land-air operation involving Chadian troops and helicopter-borne French troops of the 1er régiment de chasseurs parachutistes (1er RCP) and the 21e Régiment d’Infanterie de Marine (21e RIMa – actually a light armored unit despite its name) as well as elements of other units formed into a combined-arms tactical battle group (L’Express, February 21, 2013). Since then, 2e REP has continued operations in northern Mali as part of France’s military strategy for northern Africa, Operation Barkhane. In mid-April, perhaps as much in an attempt to engage in high-level training in oppressive conditions as from operational concerns, 2e REP made a daring night jump into the unfamiliar terrain of the Salvador Pass linking Libya to Niger, a desolate but strategically important site frequently used by Saharan smugglers, terrorists and insurgents. There are unconfirmed reports that French Special Forces were inserted into the Pass in the early days of Operation Serval and even mounted cross-border operations against jihadists who had fled to the ungoverned regions of south-western Libya. Rather than drop the paras into the Pass itself, it was decided to land them on the adjacent Manguéni Plateau five kilometers from the Pass. There they were met by their operational partners, 50 men of the much lower-budget Nigerien Army who were forced to drive rather than fly to the rendezvous. Food and water were supplied to the French troops on pallets dropped by C-130 cargo aircraft. After consolidating control of the Salvador Pass, the French and Nigerien troops left on a long and challenging drive to the old colonial-era Legion fort at Madama on the Djado Plateau, near which French forces set up a forward operating base and airstrip in October 2014. 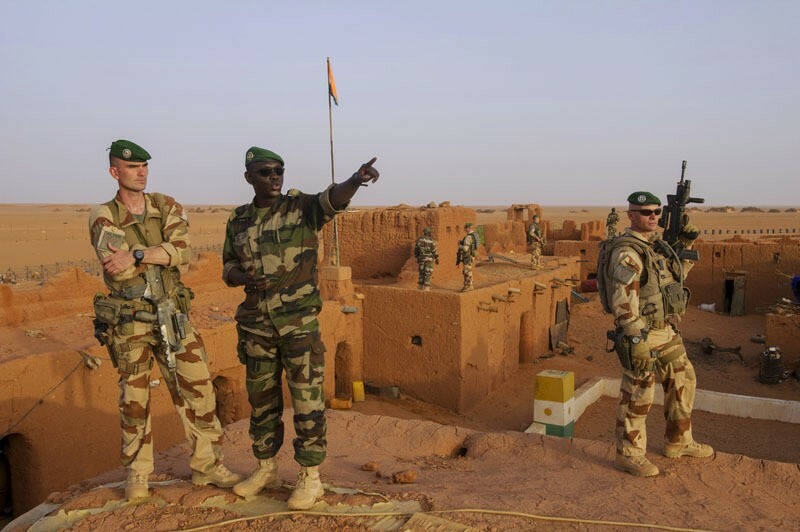 The fort still has a garrison of Nigerien troops tasked with controlling the smuggling and trafficking routes that run through the area, some of which are used by al-Qaeda in the Islamic Maghreb and the related al-Murabitoun. The drive to Fort Madama exposed some weaknesses in the six-wheeled Panhard ERC 90 Sagaie armored all-terrain vehicles used by the French in northern Mali, as they began to quickly break down in the harsh conditions and terrain; according to the unit’s colonel, “Our vehicles are designed for Europe. Here, we are left with temperatures rising to 40-45 degrees maybe even 50 degrees. Our tanks are not designed for that and also suffer from the sand. It creeps everywhere and everything deteriorates” (RFI, April 23, 2015). While no contact was made with jihadist forces or the region’s elusive smugglers during Operation Kunama II, it provided necessary field experience, training opportunities and logistical support practice for French military forces in some of the world’s most hostile terrain. Though jihadist activities were not interrupted by the operation, it nevertheless sent a clear signal to jihadis and smugglers alike that powerful French forces can be deployed in the Niger-Libya border region within hours if the presence of armed groups in the area is detected by French Harfang drones based in the Nigerien capital of Niamey. These improvised formations with integrated fire support are known in the French Army as Groupement tactique interarmes (GTIA). French troops typically train and operate in such formations. This entry was posted in France, Libya, Niger and tagged French Foreign Legion by McGregor. Bookmark the permalink.